I’m very fortunate to live in an area where we have an extended growing season. While I miss certain crops that need cold weather to grow well (like currants) I’m loving the veggies that come out of my garden. This lovely picture is the purple cauliflower that is currently growing in the garden. It’s delicious and tastes just like the white cauliflower that we are all used to. 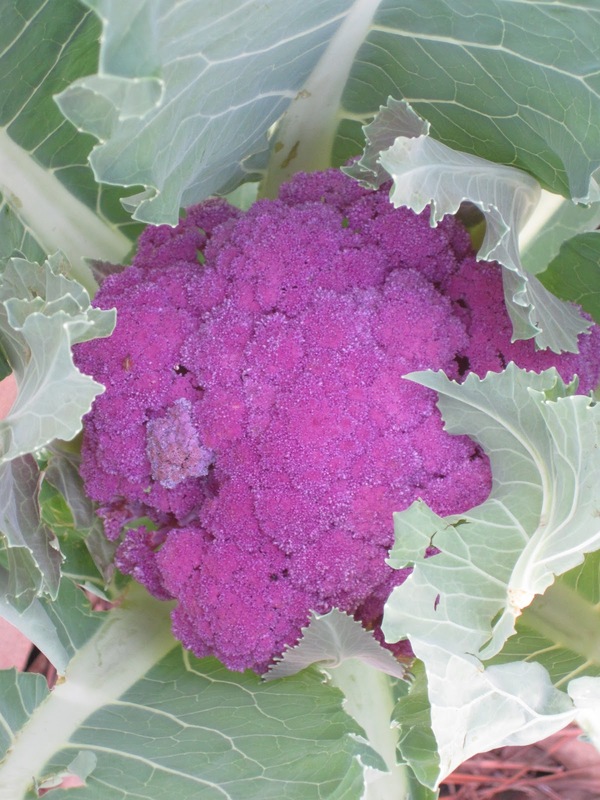 The purple color comes from anthocyanins, a highly active antioxidant. As a cruciferous vegetable cauliflower is, of course, high in fiber. It also provides excellent levels of vitamin C, K, and folate. It’s delicious steamed, baked, roasted, and can even be eaten raw. The tastiness doesn’t stop with the florets. Those lovely leaves are also edible. I often use them as a green vegetable in stir fry or sauteed with onions and garlic. A friend of mine recently told me that he used his in place of kale to make cauliflower chips and they were delicious. I love kale chips and so I’m going to have to try that with this batch of greens. Needing to come up with something for dinner I decided that soup was the order of the day. Quick, easy and versatile soups are always a great way to use up leftovers for a delicious meal. It’s like my own version of a kitchen chef contest, what-can-I-make-with-these-ingredients. I often joke that instead of the kitchen shows where the chef-contestants have access to a kitchen with every ingredient imaginable, there needs to be a cooking show where you have a refrigerator full of leftovers and a traditionally stocked pantry. While I’m not sure what anyone else would have made with my ingredients on hand; this is what I came up with. In this case a meatball soup seemed like a perfect dinner recipe to me. It was a hit and this recipe will be making a regular appearance at our table. Recently I went to a party and I needed to bring a dish to share. The food theme of the evening was Mediterranean. Wanting to make something fresh and different (and more than just the typical hummus and pita or a Greek salad) I rummaged around in my pantry and put together this amazingly delicious rice salad. One of the great things about this dish is that it makes use of fresh vegetables and fresh herbs. I love salads like this, often preferring them the next day after the flavors have had a chance to meld and blend. It was a big hit at the party and my family was rather disappointed that I didn’t bring home more leftovers. I got two thumbs up from the kids (my personal taste testers) and they told me that I should definitely make it again. Mix all ingredients together, toss well, let sit 2-3 hours for flavors to develop. It probably took longer to write that than it takes to do it. Once you do this you’ll wonder why you ever de-stemmed leafy herbs any other way. Just a short post today. I recently found out that a number of my friends didn’t know this super simple trick for growing spring onions (some folks call them green onions) indoors. So I thought I’d share. Trim off any wilted or slimy bits from the onion. Cut the ends so that there is at least 1″ of white bulb above the roots. Place root end down into a glass with a little water at the bottom. Place in a window where they will get indirect sunlight. Watch them grow, cut and use as needed. Isn’t that cool? I find it’s best the first time you let them re-grow. After that it doesn’t always work as well and they’re not as firm. But it’s a great way to always make sure you have some on hand, especially if you use these onions a lot. And I do. So what do I use them for? Soups, salads, as a garnish, in sauteed greens, in stir fry, they’re very useful, high in vitamin K, and a tasty addition to a lot of dishes. Note: Thanks to Mike for the reminder. I forgot to mention in the instructions that you need to change the water daily. Otherwise the jar gets rather stinky and the onions won’t continue to grow. Nuts are a great heart-healthy food. They shouldn’t need a special day, October 22, for you to consider adding them to your diet. It’s important to know that raw nuts are best for you. With conventionally roasted nuts, even dry roasting, the roasting process may seem tastier, but the oils are usually not the best quality. The oil can potentially be genetically modified corn, or from highly acidifying peanut oil, neither of which is something that we recommend. In addition to the poor choice of oils, the heat destroys some of the nutrients in the nuts. Drain and then dry in dehydrator or oven set at 175ºF 12-24 hours or until completely dry. Nuts provide a good source of protein. They’re also highly antioxidant, great for cardiovascular health, and a delicious choice for snacking. There is even some evidence that eating nuts can be healthy for maintaining weight. They can be added to salads, cooked dishes, eaten as a snack, sprinkled into breakfast cereal. There are many different ways to eat include them in your diet. While they’re great on their own, they can also be a fabulous addition to salads, desserts, and even pilafs or casseroles. One of my favorite ways to eat nuts is to make my 3-2-1 Trail Mix. This is a great nutrient dense snack (especially if you soak the nuts and seeds ahead of time) and perfect for on-the-go or anytime you need a quick protein boost. Different nuts have different nutrients making it a good idea to snack on a variety rather than just one or two. I find that a quick and easy trail mix is 3 parts nuts, 2 parts seeds, 1 part dried fruit. Mixing different nuts and seeds gives you a tasty treat and a nutritional boost. Our family went to dinner at The Counter last night, a new eatery in town. The concept behind this place is that it is a build-your-own burger joint. Walking in we were greeted by very friendly people with fantastic music in the background. My husband and I were amused that somehow the place has managed to hit the exact right blend of music. Not only did we like it, our teenager liked it and our young server liked it too. We were given a menu that allowed us to create our perfect burger from four different proteins, the choice of a burger or a bowl, followed by a very wide selection of cheeses, toppings, sauces, and a choice of buns. My husband ordered a beef burger with gruyere cheese and an assortment of toppings, our daughter choose a veggie burger with her topping preferences and I choose a chicken breast to be served in a bowl. Several things stood out with our order that I thought were fabulous. Their beef is humanely raised, grass fed, antibiotic and hormone free and they claim it is never frozen. The veggie burgers are made in-house and are not simply reheated, cardboard tasting, burger-shaped pucks. My salad was made with organic greens. All three tasted absolutely delicious. The beef was tender, juicy and very flavorful. The veggie burger was, quite frankly, the best veggie burger I have ever had. I’m not sure how they make it but it was moist and really stood out compared to any other veggie burger. My chicken salad came on a bed of organic greens with the most amazing pesto. I loved the fact that my sauce came on the side so I could choose how much I put on my meal. We also shared some sweet potato fries with a horseradish mayonnaise. While I’m certainly used to eating mayonnaise with my fries I will confess that I really don’t like horseradish so I was suspicious of why anyone would put it into mayonnaise. It turned out to be the perfect compliment to the fries. Not too strong, certainly not overwhelming, just a tiny bit of bite that went very well with the sweetness of the thin cut fries. We ended the meal by sharing an oversize chocolate chip cookie that was so large we wound up taking half of it home. And speaking of taking it home, I was really happy to see a wax paper lined box instead of a styrofoam container. A few things stood out to me that I think would improve the restaurant. The artwork was great but I felt that otherwise the blue and chrome decor was rather cold and sparse. I’d love to see it warmed up a bit. I’m a little disappointed that with all of the wonderful local, organic, humanely raised, etc they still had conventional ketchup on the table. Sadly that ketchup is made with high fructose corn syrup and not a healthy choice. I would also have liked sea salt and fresh ground pepper on the table. Overall I think this restaurant has a lot going for it and I hope that it will be successful and stay in the area. I love the concept, I really like a lot of their food choices and what they stand for. I absolutely admire the fact that a number of things, their sauces, the veggie burger, and even their cookies are all made in-house on the premises. That speaks a lot to the quality that they are going for and it shows in how tasty their food is. I liked the food so much that as I was walking out the door I was already thinking about ideas for what I will build the next time I go back. If you haven’t been yet go check it out, they have locations all over the country and even a couple of locations in Ireland.